Unselective markers: Many of the hotspot genetic variants associated with autism and schizophrenia crop up in samples labeled with a wide variety of clinical diagnoses. Genetic variations linked to autism and schizophrenia crop up in people with a large variety of conditions, including bipolar disorder, seizures and obsessive-compulsive disorder, as well as in healthy people. This notion gained new support from unpublished data presented Thursday at the World Congress for Psychiatric Genetics in San Diego. Researchers from Signature Genomics, a private clinical genetic testing company in Spokane, Washington, have found, for instance, that many children with autism inherit deletions in the 16p11.2 chromosomal region � famously linked to autism � from healthy parents with no sign of the disorder. The findings debunk previous hype that any one variant is crucial for a particular disorder, the researchers say. Genetic studies of schizophrenia have relied on linkage studies, which trace how genes are passed down within families, and on genome-wide association studies, which sift out variants that occur more frequently in large groups of those with the disorder. These approaches have "left us a little disappointed, and have not lived up to their early promise," says Trilochan Sahoo, Signature's laboratory director. The company's scientists instead use whole-genome arrays, targeted to a couple of hundred key genetic regions, to find large DNA deletions or duplications � called copy number variations (CNVs) � in blood samples sent to them from clinics across the country. Several studies in the past couple of years have spotted regions of the genome that harbor CNVs � whether spontaneous or inherited � that are associated with autism and schizophrenia. For instance, many teams have independently found 'hotspots' in chromosomes 1, 15, 16 and 22 associated with schizophrenia. Since 2005, Signature Genomics has received more than 40,000 samples, Sahoo says. Most are from children whose doctors want to pinpoint the roots of developmental problems ranging from congenital heart defects to mental retardation. This massive data set has shown that many of the hotspot CNVs previously associated with schizophrenia crop up in samples labeled with a wide variety of clinical diagnoses � but rarely schizophrenia. 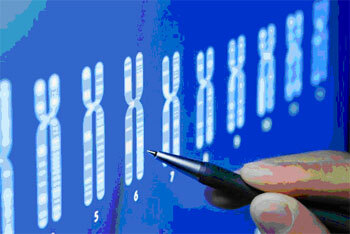 For example, the company has collected 270 samples with deletions or duplications in the 22q11.2 chromosomal region, which has been linked to DiGeorge syndrome � a congenital disorder that causes neuromuscular problems and learning problems � and has been fingered in previous studies in about 2 percent of people with schizophrenia. The company's 22q11.2 samples turned out to be from children with developmental delay, dysmorphic features, heart defects, and behavioral problems, but not schizophrenia. Similarly, Signature Genomics has more than 160 cases of deletions or duplications in the 16p11.2 region, labeled with developmental delay, autism, as well as speech and language problems. Deletions in this region have repeatedly been linked to autism. In October, researchers reported that duplications in the region are also significantly associated with schizophrenia, but Sahoo says his company's data do not support this link. The company has also amassed more than 100 samples carrying small deletions in the 15q13.3 region, which several studies have tied to autism. These samples are labeled with autism, developmental delay, seizures and obsessive-compulsive disorder, "with none of them having a phenotype remotely suggestive of schizophrenia," Sahoo said. "It's fabulous work, and it's exactly what needs to be done," said Pamela Sklar, who chaired the session in which Sahoo presented his results. On the other hand, "nobody is arguing that these CNVs are primary causes, either for autism or for schizophrenia. They're risk factors," noted Sklar, associate professor of psychiatry at Harvard Medical School. In August, Sklar and colleagues reported that thousands of common genetic variants confer a tiny increased risk of schizophrenia, suggesting that the disease is caused by the complex interaction of many genes1. Sklar also pointed out a major problem with Sahoo's logic. Typically, the symptoms of schizophrenia don't appear until early adulthood � about a decade later than the average age of Signature Genomics' samples. "You wouldn't expect children at age 8 to show signs of schizophrenia," she said. About 8 to 12 percent of Signature's samples come labeled with autism. The samples are labeled by the referring clinics, however, which don't always use standard diagnostic measures. Sahoo said that clinicians often use the term 'autism' loosely. In this group, the scientists found several CNVs that have not been fingered by previous studies, which they plan to publish soon. They're also finding that some of the CNVs with the strongest link to autism in previous studies � notably, 16p11.2 deletions � are extremely common among samples with all sorts of psychiatric disorders, including autism, and are often inherited from healthy parents. "We are seeing it so commonly inherited from parents who are absolutely normal, that we are beginning to hesitate to call it a pathogenic alteration," he says. Because of the small sample sizes of previous studies, he added, "the initial hype about these loci being associated with autism and schizophrenia, I think, was overblown."